CHARLESTON, W.Va. – Claims by coal industry officials that President Obama and the Environmental Protection Agency (EPA) are waging a “War on Coal” are nothing more than propaganda. One of their own proved that recently when speaking at the West Virginia Coal Association meeting here. Ernie Thrasher, CEO of Pennsylvania-based exporting firm Xcoal Energy told the Jan. 28 gathering, “We’ve got a lot of things working against us that we don’t have any influence on,” according to a story by reporter Jared Hunt of the Charleston Daily Mail. In short, the free market – not the EPA – is creating a bleak outlook for the industry. 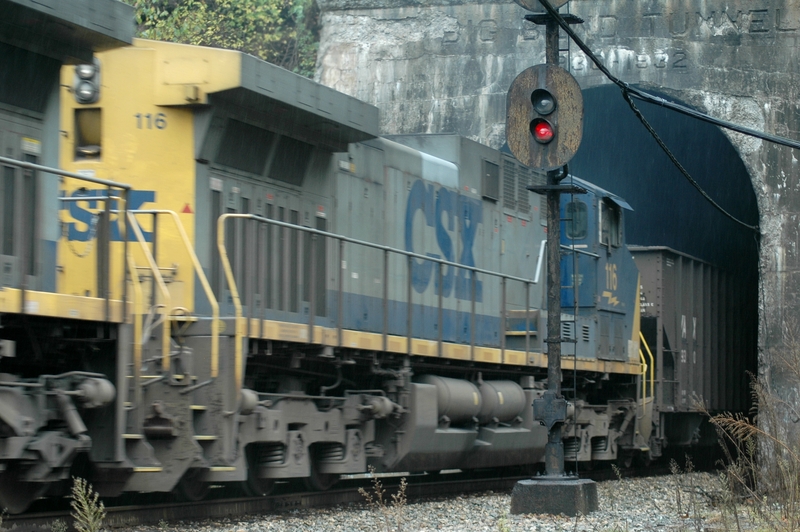 A train hauls coal east as it emerges from the Big Bend Tunnel near Talcott, W.Va. While the world economy has been growing since coming out of the economic crisis of 2008, that growth has slowed from 3.5 percent to 2.5 percent. He cited also China economic policy, financial stimulus packages adopted by many nations in response to the 2008 worldwide recession, poor investments and overproduction by coal companies, and “…extraordinary weather-related events between 2009 and 2012, including avalanches in Canada and floods in Australia, (which) temporarily curtailed production in those coal producing regions.” (There was no indication if he recognized the irony of climate change having a negative impact upon the coal industry). So, the mythical “War on Coal” must be recognized for what it is – an attempt by the coal industry to distract us from the real issue we must consider – the proven, detrimental impact of coal production and use upon people, air, water and eco-systems, in particular in Appalachia. Of course, the industry wants us to believe that the EPA and the president are the ones “killing jobs.” It is ironic, to put it mildly, that the coal industry would feign concern for its workforce in light of the industry’s history, including a century of disregard for safety and the resurgent epidemic of black lung disease. The fact that the coal industry is being disingenuous regarding the cause of its decline demonstrates how the people of Appalachia can be adversely impacted by not only the tactics of the industry, but the elected officials the industry hand-picks and finances. Additionally, there are very, very few truly independent press or media outlets in the region. So, this triumvirate of industry, politicians and the press, which places profits and power over the welfare of people and the land – is effectively stifling honest debate regarding the costs and benefits of the coal industry. © Appalachian Chronicle, 2015. The Appalachian Chronicle is a publication of the Appalachian Preservation Project, which is assisting with the “Preserving Sacred Appalachia” conference scheduled for April in Charleston. Learn more here.